This folded letter was sent from Copenhagen. with two bold PD marks indicating the full fee had been collected. A fine strike of Copenhagen CDS was applied. The following is surmise and I'd appreciate any further input. The routing then went to Hamburg. En route a transit mark was applied on August 12 (purple at lower right rear). (Royal Danish head post office) Hamburg. The Danish post office in Hamburg operated ca 1837-1864. This post office was the exchange point for Danish mails with the Thurn and Taxis postal system. Thurn and Taxis began operating mail systems in Europe in 1460 in the Tyrol in northern Italy. provided mail service throughout much of Europe. Thurn and Taxis continued to provide service in the northern German states. They would have received Danish mail bound for western Europe at this time in Hamburg. and a black HAMBURG CDS above the transit mark noted above was applied. Valenciennes, the exchange point with the French mails. southeast of Lille, France, and 60 km west of Charleroi. Belgium. The red French CDS on the front indicated the letter arrived in Valenciennes on August 13.
exchange point between St. Jean de Luz in France and Irun in Spain. These towns are on the coast in the southeast corner of the Bay of Biscay. Most mail (80% or so) between Spain and the rest of Europe went through these offices. and a maritime route between Marseille and Barcelona. Experience suggest that the letters using the maritime route were going to Barcelona or Valencia. The map below is from the Atlas Postal y Geographico; Angel Moreno Redondo (1913). 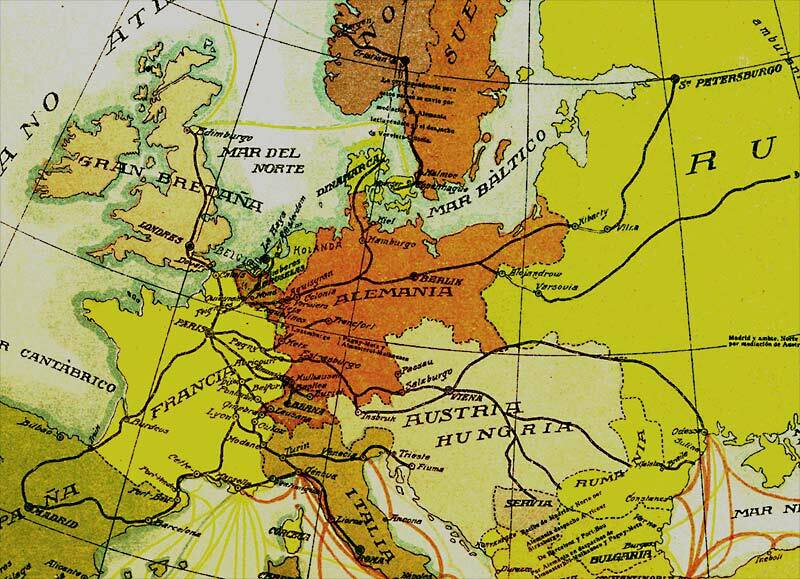 It shows the main postal routes to Spain from most of Europe during the latter XIX century. then into Belgium through Verviers and then into France, to Paris. From Paris, two different routes are possible. enter Spain at Irun and then down to Madrid. at La Junquera, then to Barcelona and finally travel west to Madrid. The western route is most likely for mail bound for Madrid. It is likely that the bold red 9.R mark was applied in Irun during the exchange process. It is also where the script Fr in the lower left front was applied. This was an abbreviation for Franco indicating the letter was paid in advance. a red CDS on the back of the letter noted its arrival on, I believe, August 20. 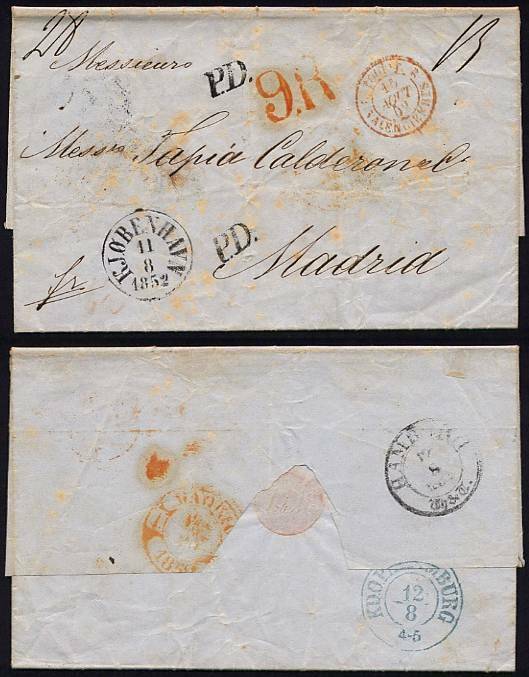 There was no specific Spanish rate for mail from Denmark until June 29 1853.
was to charge the same rate as if it had come from the German state. In addition to reviewing the routes, we also need to review the rate markings. probably relates to a Danish total fee of 28 skilling. the lower left and would have been applied at the same time. The marking in the upper right appears to be France's claim to 15 centimes. It was probably applied when the red French Valenciennes transit mark was applied. And that leaves the question of how did Thurn and Taxis get their share? Hmmm, where was the UPU when you needed it? As you can see, I can use all the help I can get to escape this quandary. I'm sure that there are several of you who know the answers to this one. *As I expected, I have received a number of helpful inputs for explaining this letter. Jim Whitford-Stark, Richard Frajola, and Jaume Balsells. It never ceases to amaze me how much information comes up when one asks for help. A special thanks to Jaume Balsells for the routing map. Spanish rate which I have incorporated nearly verbatim.